Click here to find everything you need to know about the 27th Miami International Boat Show: venues, directions, show hours and days, tickets and prices, parking and more. Dragonfly Boatworks LLC has rounded-out to become one of the premier producers of quality flats boats and lightweight skiffs. Among its competitors, it is probably the most design talented and most futuristic thinking. Mark Castlow, the driving force behind Dragonfly Boatworks LLC, has been an entrepreneur all of his life and everything he’s ventured into has been H20 based. As a kid, he started with building surf boards. The center of his focus for the last several decades has been flats boats, lightweight skiffs and more recently SUP boards. The continuos output of practical, user friendly, and the highest quality flats boats, lightweight skiffs and tenders at reasonable pricing has moved Dragonfly to the head of the class. Castlow has a winner business approach. He never stops listening, engages his workforce on all design features and never, out-of-hand, turns down an idea. He himself is a walking idea machine, and that’s probably why he’s always ahead of the curve. Many so called high end skiff manufacturers, when they produce a new skiff, seem to always be fixing design hiccups post production. When a new model Dragonfly is for sale, it’s ready. No oops, we need to fix this or that. Mark believes what he says: “We build one of a kind one at a time skiffs and paddle boards.” He’s already produced special-needs tenders and skiffs that were design challenges that no current builder, that we can think of, could possibly take on. There’a a trend unfolding, and it’s a favorable one for anglers who want to fish inshore and offshore. It all started just a few years ago when the recovery had firmed up. 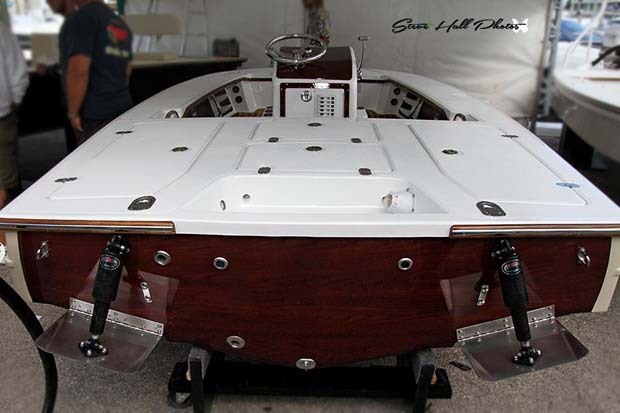 A few previously dedicated flats boat builders seriously entered the offshore / bay boat market. They have created a fuss. These new entrants are building shallow draft vessels with great attention paid to fit and finish. Adding their primary knowledge of what sport anglers of every stripe need and want in an insore/offshore fishing machine. And yes, price. Anglers can get what they want at a reasonable price. What a concept. The Sabalo 27 was designed to slice waves and deliver a smooth, stable and dry ride. The deep-v bow entry has double lifting strakes and reverse chines running aft to create lift and improve maneuverability. The reverse chines also deflect water down to keep occupants dry. A flat pad at the stern creates a stable running surface and allows the boat to operate efficiently with less horsepower. Trim tabs are recessed into the hull for more effective operation. The transom is rounded so that water rolls off the sides in reverse instead of over the transom. Her interior features a true self bailing cockpit (it does not drain into the bilge) with walk around gunnels and large rear deck housing a built-in 35 gallon livewell and two storage lockers (or 10 gal crab pots). Her anchor locker even features a built-in hanger for easy access. There are 5 dry lockers in the floor (besides the bilge). Two of them being large enough for rod storage, and the largest an insulated fish box. The spacious console has enough room for any amount of electronics, and features a built-in head inside. Fishing or fly fishing from a Twin Vee Catamaran, almost no matter the sea, is like angling from a dance floor. It’s the stablest of platforms available. And the run out to your fishing coordinate on a heavy sea day will not create a need for an orthopedic visit. Twin Vee’s slice through waves, they don’t ride them. 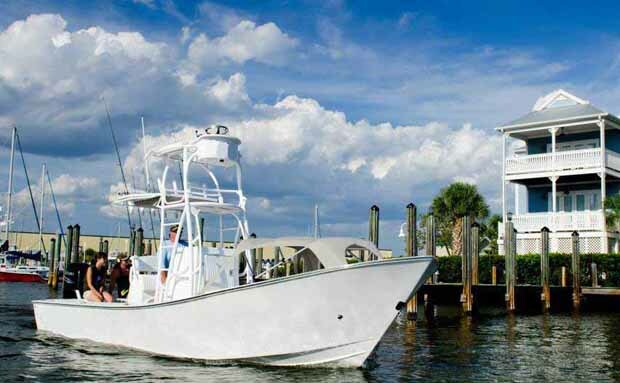 Roger Dunshee, founder and designer of Twin Vee Catamarans, has been at the business of perfection for over 20 years. Unquestionably, the Twin Vee 26-foot catamaran is best-selling cat in its class in the U.S. And it just got better. This year, Dunshee made changes that make the famous ride even better. It remains the softest ride in the water; ever. To arrange a demo ride or get detailed info about Twin Vee’s contact Chuck Genever, Sale’s Director. 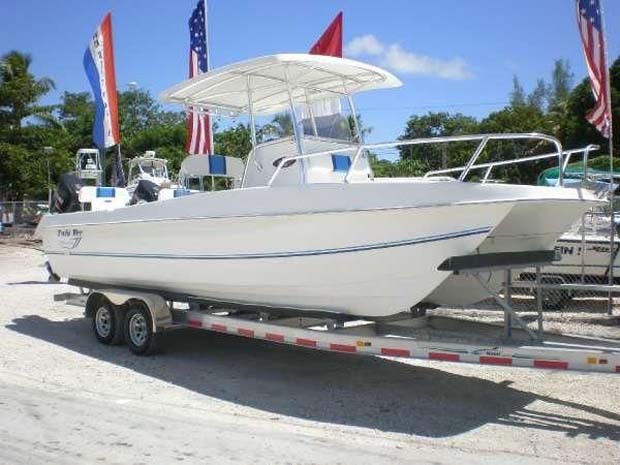 He will be at the show taking appointments for sea trails of Twin Vee’s 26’ Center Console, 29’ Express and 31’ Center Console.